Introduced by Beretta in 1992, the "Cougar" series was targeted as a compact sized handgun for self-defense and law enforcement. The larger overall size of the popular Beretta 92 was not optimal for concealed carry or undercover work, so Beretta introduced the Cougar series as a more compact CCW or plainclothes carry option. Originally, Beretta engineers were designing the Cougar to be chambered in the S&W .40 caliber, which was a hot new cartridge at the time. However, they ultimately scrapped that plan and opted to introduce the first Cougar series (the 8000 model) in 9mm. The .40 caliber model (the 8040) followed two years later. 8000 - Chambered for 9mm. 8040 - Chambered for a S&W .40 cal. 8357 - Chambered for the .357 Sig caliber. 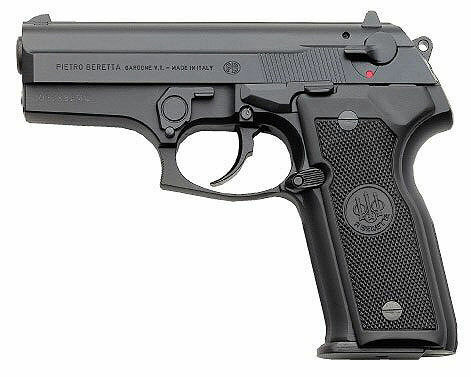 Supposedly, Beretta also offered versions of the Cougar series in Europe that were chambered in the .41 AE and 9X21mm, although that’s yet to be confirmed. F Version – The most basic version Beretta offered that was a single/double action that included an exposed hammer and ambidextrous safety/decocking lever. D Version – This was a DAO (Double Action Only) model with a spurless hammer and no safety or decocking lever. G Version – This variant was a DA/SA (Double action/Single Action) version with a decock lever, but no safety. This model has the exposed hammer, which can be decocked, but lacks the safety found on the “F” version. T Version – The original Cougar models, regardless of the caliber, did not feature a picatinny rail, so Beretta introduced the “T” version, which did feature a “tactical rail”. Mini Cougar – The 8000, 8040, and 8045 versions of the Cougar series were also available in more compact version called the Mini Cougar as well. The Mini Cougar models had the same barrel and slide length from the standard models but featured a slightly shorter grip. The shorter grip also meant that the Mini-Cougar models had a slightly lower round capacity when compared to the full-size models. The Mini Cougar models were only produced in either a Type D or Type F configuration. In 2005, Beretta opted to license the name and production rights to Stoeger Industries, which is a subsidiary company of Beretta. All the Cougar models are now manufactured as the Stoeger Cougar. #1 – I have a Beretta Cougar 8357, but am having trouble locating a holster to fit it? I see holsters advertised to fit the 8000 and the 8045, but nothing for the Cougar 8357 model? Do you offer a Beretta Cougar 8357 holster? Luckily, Beretta built the 8000, 8040, and the 8357 on the same frame. As such, your 8357 will fit in a holster made for the Beretta 8000 or 8040. Now, the 8045 model is a different story as it requires a holster specifically made for the 8045 model. #2 – I have a Cougar 8040 Type D and I can’t find a holster for it anywhere. Do you have anything to fit it? If you are shopping for a holster with a thumb break or retention strap, then the specific Type does play a role. The Type F models, Type G models, and the Type T models all have an exposed hammer, so those models will generally work fine for holsters with a thumb break. However, the Type D versions feature a spurless hammer so those will not fit a holster with a thumb break as there isn’t a full hammer for the thumb break or retention strap to fit over. #3 – Do you carry a Beretta Mini Cougar 8045 holster? Since the only difference between the Mini Cougar models and the standard Cougar models is the length of the grip, a Mini Cougar model fits into a holster made for a full-size Cougar. So, to answer your question, your Mini cougar 8045 would fit into a holster made for the standard Beretta 8045 model. #4 – I inherited a Beretta Cougar 8000T model but have had real trouble finding any holsters to fit it. Do you have any holsters to fit this model? As we mentioned before above, since the T series have an integrated accessory rail in the frame, they won’t fit most holster molded for a standard Cougar model. However, we can support a holster for the Beretta Cougar T series. #5 – I recently bought a Stoeger Cougar, but no one seems to make a holster for it? #6 – Will a Beretta 8045 chambered in 45 ACP fit in a holster made for the 8000 which is a 9mm model? Honestly it depends on the holster brand as the slide on the Beretta 8045 model is only slightly larger than the slide on the 8000 or 8040 models. With the Cougar series, the 8000, 8040, and 8357 all fit into a holster made for the Beretta 8000. However, the 8045 is built on a larger frame, so it requires its own unique holster. Any holster listed below is available in a version to fit the Beretta 8000, Beretta 8040, Beretta 8357, or Beretta 8045.